In the retail industry, there are two major ways for your business to look professional in terms of advertising and messaging. Your first option is to create over-the-top advertising where it is clear that you have spent tons of money and spent tons of time creating superior branding and messaging. And, while this is usually highly effective, it is rarely cost effective for any but the largest of businesses. The other option for professionalism is to create product advertising and branding that looks simple, flawless, and effortless. It doesn't have to dazzle. It just has to be presented in such a way that the viewer can't see behind the curtain to see the mundane bits that permit your advertising and point of purchase signage to function. If this is the in-store signage model of your business, magnetic sign clips and magnetic sign holders for retail use are certain to be the secret behind your success. These products allow your business to easily display signs in just about any location in an efficient and subtle manner. Consider how these benefits create a sense of professionalism. Invisible or easily hidden - Magnetic sign clips and holders attach to the sign and a fixed object in such a way that the viewer usually can't see them while reading the sign. This ensures that your customers remained engaged with the contents of the sign itself, rather than the components used to hold it in place. Attaches to a variety of surfaces - A magnetic sign holder can be placed in just about any location where there is a metal steel surface. This lets you put signs on gondola shelving, beverage cooler door frames, cooler wire shelves, refrigerated display cases, appliances, ceiling grids, and food service equipment, as long as there is a nearby metal surface. Additionally, the wide variety of available retail sign holders and clips ensures your sign will look good in just about any position in your retail space. Attaches securely - If you have ever used a magnet, you know that while it may be relatively easy to place one down, it takes intentional effort to actually lift one from the metal surface it is attached to. This ensures that your signs won't fall, be bumped or be knocked down by errant customers or staff. This makes magnetic retail signs ideal for high traffic areas of your store. Easy to change - One of the best advantages of magnetic sign holders for retail use is the ability to easily reposition signs, move signs, or add new signs. The most effective professional marketing changes regularly with each promotion, never letting messages grow stale. 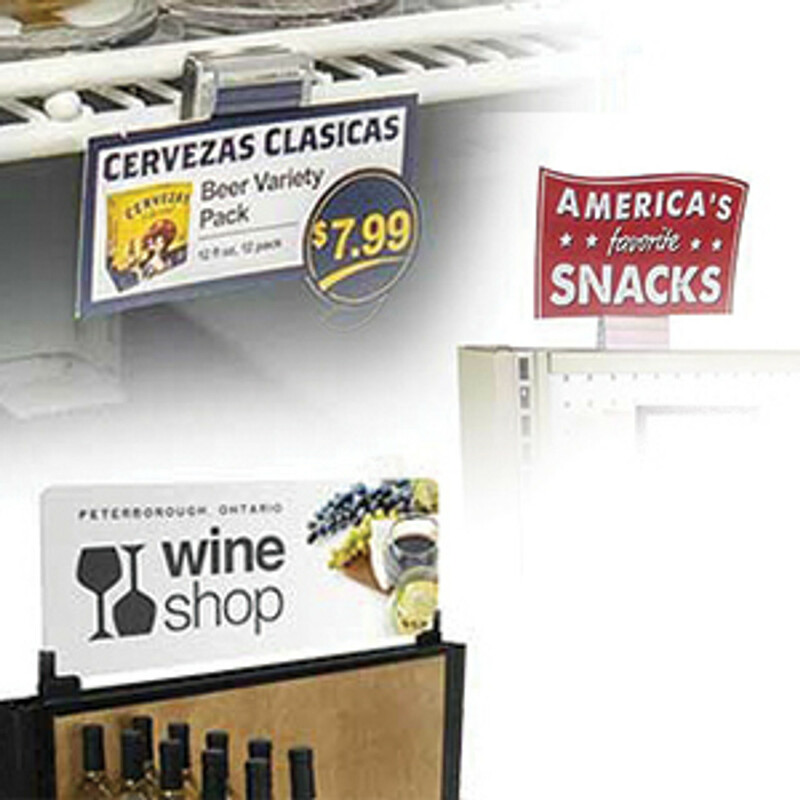 With a variety of magnetic retail sign holders, you can regularly introduce new messaging, advertise new sales, change price tags, or simply highlight new products. It can actually take a lot of work to regularly create, update, and disperse messaging and advertising around your retail space, but with a magnetic retail sign holder, that effort is never apparent to your customer base. When you are trying to maintain an air of professionalism, that is a good thing. However, while it may take moderate effort to maintain your marketing strategy, these sign holders and clips are easy enough to use that you won't need to hire 3rd party assistance to make these changes around your retail space. Every store requires different messaging and advertising to optimize profits. Determining precisely what works for yours may take time, but it helps to know what options are available. This simple product is designed to attach to shelves primarily and tends to be best for businesses that allow customers to engage in off-the-shelf shopping, usually in a retail setting with aisles. Usually designed to hold a sign horizontally so it juts out of a shelf, these clips are very common in liquor stores. They have roughly the same usage as tag holders. However, because the presentation is bolder, they can also be used to highlight a specific product, possibly because it is new or on sale. These holders attach signs to the ceiling. In an aisle setting, they are great for hanging signs that list the categories of the aisle. They also tend to be highly useful for displaying information near the point of purchase. Whether you are setting up a store for the first time or you simply want to modernize the way you present messaging, advertising, and branding in your store, magnetic retail sign holders and clips are a cost efficient and time efficient way to maximize your in-store advertising. Choose DGS Retail as your complete source for retail design solutions and equipment.